For when a normal Car Jack can not be used. There are situations where you can not use your normal car jack. 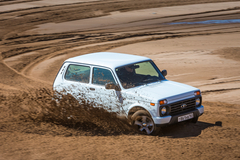 For example when your car is stuck in sand or mud. But also for changing wheels, mounting snow chains, to lift a low built sports car or to level a caravan. In these cases the Ha-Ka Air Jack can help you solve the problem. 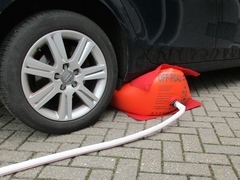 The Air jack can be inflated either with a (12V) cair compressor or with the exhaust gases. We can recommend you the 12 V black & Decker ASI 500 which cost around € 90,00. 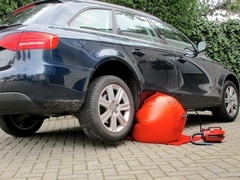 In rally’s and off the road driving this lifting bag can be extremely helpful. Are you stuck in sand or mud, just use your Air Jack and you get yourself out quickly. The lifting capacity is 4 Ton, the max air pressure is 1.2 Bar. The diameter is 650mm and the lifting height is 780mm. Now for only € 157,00 excl. VAT and excl. shipping costs.